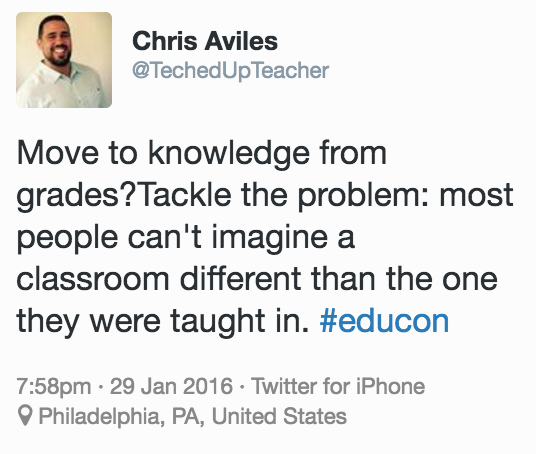 Educon, for me, has always been such a hotbed of fresh ideas. This year, the theme of Educon 2.8 is EMPOWERMENT. Here is part of the Friday night panel conversation that seriously resonated with me. I didn’t ask the question, but I am thankful to the person who did. How do we transform students from learning for their grades to learning for knowledge? College in some ways hinders that opportunity for growth when it comes to ideas. I have said to my sister, “Don’t go to college. I will help you create an idea instead”. Will your fails from your ideas be bigger than the debt from going to college? When you go to college you come out with big debt and then you have to work for someone else to pay it off. which that we have gotten to such a narrow path of understanding. I would really think that it is our ultimate challenge as the educators of children and leaders of learning to understand that we are we on a very, very narrow path of knowledge, and defining it, and reducing it, and measuring it, and KILLING it, ultimately. How do we transform students from learning for their grades to learning for knowledge? What do you think? 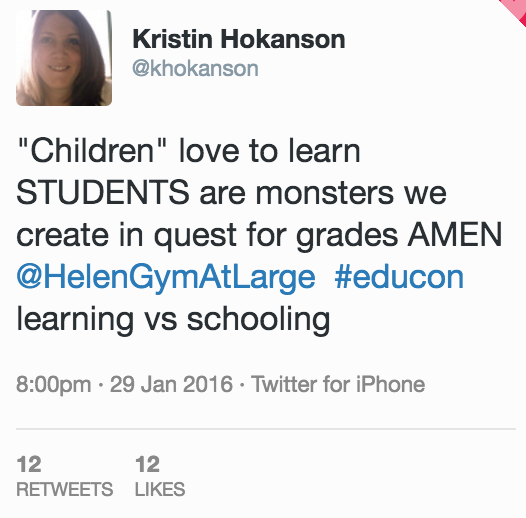 Breaking the cycle of grades vs learning should not just be relegated to faculties of education. Needs to be done at all levels of learning or it’s like whistling in the wind – you end up with spit on your face! Small changes in the face of the Marks Monster along with open, honest questions can make a bit of a difference. Having a ‘fluid syllabus’ where marks are less of a focus and connected to student initiative can be a start. Don’t have all the answers cause grades still matter at so many levels!